Bored with routine Chutney or Sambar for Idli / Dosa varieties? 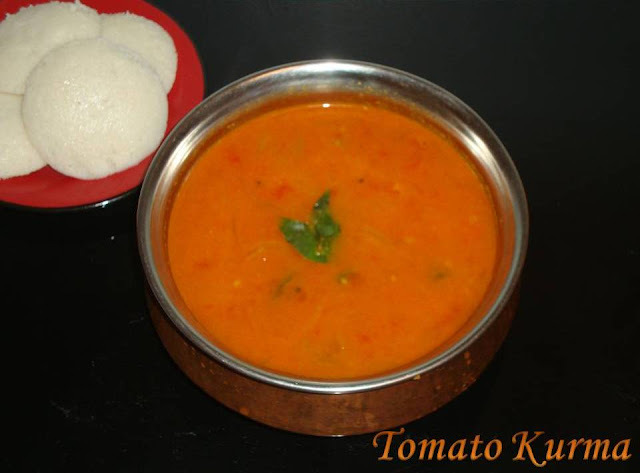 Try out this native style gravy from Tamil Nadu (my mother's style!). Boil tomato in water until tomato becomes soft. After it cools down, peel the skin of tomatoes and grind to a smooth paste. Keep aside. Grind the coconut and fennel seeds by adding little water and keep aside. Heat oil in a kadai; add cinnamon, cloves, cardamom and curry leaves. After it crackles, add the chopped onions and green chillies. Saute till the colour changes and add tomatoes puree, red chilli powder, corriander powder, turmeric powder, coconut fennel seed paste and salt. Mix thoroughly and add 1 to 1½ cup of water; allow to boil. This gravy have to be little watery, so adjust the water consistency according to your preference. Close the pan with a lid and cook in a medium flame for 5 to 10 minutes, till the raw smell goes and oil separates. Garnish with corriander leaves and serve hot. This will also be a best accompaniment for Appam, Chappathi and Idiyappam (String Hoppers). I am sending this recipe to Sowmya's page and Gayathri's page for the event for Walk Through Memory Lane. my fav kurma with idli n dosa,looks very tempting!! It must be so flavorful.. love to eat with hot idly..
Wow, kurma with idli, a very interesting combination! !